The majestic bald eagle, the national bird of the United States, was nearly extinct in the 1970s due to illegal hunting and the effects of DDT poisoning. Thanks to recovery efforts and stronger federal protection, however, this large raptor is no longer endangered and continues to make a strong comeback. Mature bald eagles are immediately recognizable, not because they're bald, but because their stark white heads give that appearance when contrasted with their chocolate brown bodies. Learning other field marks can help birders better identify these raptors at other ages when they look quite different. Markings: Male and female birds look alike (female birds are slightly larger) with a rick dark brown body that may show buff edges on the feathers. The head, neck and tail are bright, plain white, but could show faint spotting in younger birds or when feathers are dirty or worn. The eyes, bill, legs and feet are yellow. Black talons are thick and powerful. When first hatched, bald eagle chicks are covered with fluffy white down but quickly grow larger and develop mature feathers. Juvenile birds have mottled brown and white plumage and do not get the distinctive white head and tail until they are 4-5 years old when they are sexually mature and able to mate. Bald eagles are opportunistic carnivores. They only eat meat, but will choose whatever prey may be easiest, including fish, small or medium-sized mammals and a variety of birds, including gulls and waterfowl. These raptors will also eat carrion and may visit roadkill, gut piles left by hunters or carcasses abandoned by other predators. They can tear prey apart both with their powerful bills as well as their talons. 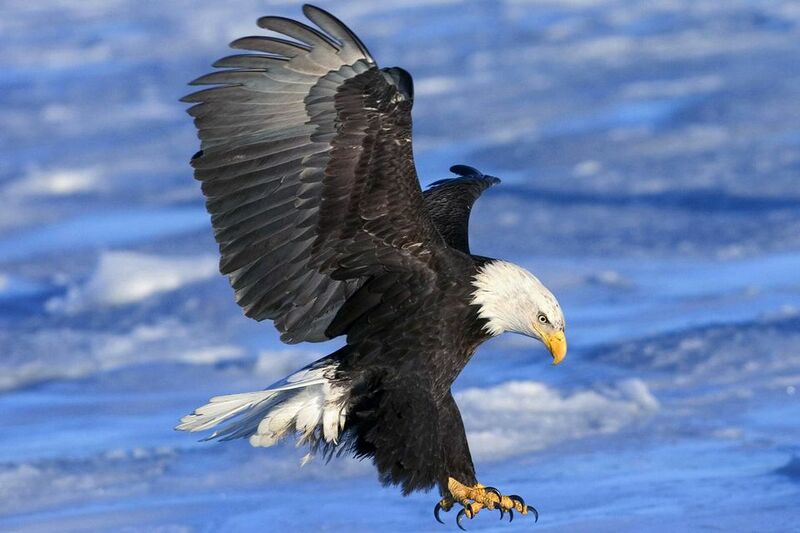 Bald eagles are fairly rare throughout the continental United States and Canada but are most often found near large, open lakes and rivers with good fish populations. Areas with scattered large trees for perching and nesting are especially preferred. Concentrations of the birds can be found in Florida, throughout Alaska and near large waterways in the Midwest. Canadian birds migrate seasonally into the United States and northern Mexico, but northern populations along the Pacific Coast and into southern Alaska are often year-round residents if waterways remain open for easy fishing. Juvenile birds that have left their parents' care but have not yet mated may wander far from expected regions. These raptors are fairly quiet and use a throaty, high pitched chatter call with a laugh-like cadence. The Hollywood long shriek often associated with bald eagles in movies is actually a red-tailed hawk. Bald eagles gather in large colonies when migrating or wherever an abundant food source can be found, though they may have squabbles over choice tidbits. They can often be seen hunting for fish or perched in trees with good fields of view, though they have an awkward, rocking gait on land and may run with their wings slightly spread for better balance. They soar on thermals looking for prey and hold their wings nearly level while airborne. While they do hunt, they are just as frequently pirates that will harass other raptors or predators to steal their prey for an easy meal. Bald eagles are monogamous birds that generally mate for life unless a pair is unable to produce eggs, and if one partner dies, the remaining partner will seek out a new mate. During courtship, these raptors have various flight displays including a fantastic cartwheeling fall where the pair locks talons in midair. Mated pairs return to the same stick nest annually and will add to the nest each year, only starting a new nest when the old one finally collapses. Older nests can reach several feet in diameter and may weigh several tons. They are typically lined with softer materials including feathers or moss. Bald eagle nests may be built in tall trees or on cliff faces depending on the availability of regional nest sites. Both parent birds incubate a single annual brood of 1-3 oval-shaped, plain white eggs for 30-45 days, and both parents will feed the young birds for 70-100 days until their first flight. Like all birds of prey, bald eagles are not generally found in backyards. Birders who live near large fishing lakes and rivers may attract these raptors with tall trees or platform perches in their yard with clear fields of view. Bald eagles were severely affected by pesticides and persecution in the 1970s and 1980s, reaching endangered status, but strong efforts to restore these birds were successful and the bald eagle was removed from the endangered species list in 2007. Today, these raptors are still victims of poaching and accidental or deliberate shootings, as well as other risks to raptors including pollution, collisions with wind turbines or power lines, contamination of their food supplies and habitat loss. Lead poisoning from fishing lures and discarded bullet casings is also a grave threat to bald eagles and other large raptors.